Paint is easy to spill and drop clothes can slip or tear, allowing the paint to get on the protected surface underneath. 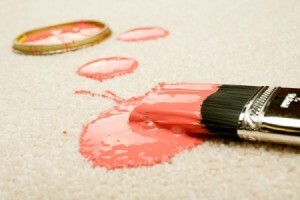 If it is carpet, the paint can be difficult to remove, especially after it dries. This is a guide about how to remove paint stains on light colored carpet. I have a brand new Berber carpet, it's off-white. I knocked over a can of lime green paint and got it all up. I steam cleaned the carpet but there is still a slight greenish tint. I scrub brushed it, tried to bleach a spot, all to no avail. Can anyone help. I just bought the carpet and I am very annoyed at myself. Thanks. Hey, my husband said watered down paint thinner. Which is what nail polish remover is too i think. Anyways read the bottle/can first to make sure it doesnt do anything to the carpet and/or glue that holds it together. I got brick red paint out of a off white berber carpet using only rubbing alcohol and a lot of muscle! It took a lot of blotting and a little rubbing with a lot of alcohol and I had to do it several times, but the carpet is back to normal! I have a light brown color carpet and my dog got into some green paint we had hidden behind the shed and came into the house marking up the carpet. I used warm water with oxy clean and blotted it up. This truly work for us. Take a soaked clothe with the solution and blot deeply and with some paper towels blot it out. It comes up easy. 1: I used a pressure steamer to break down the latex paint and scrubbed. This worked OK except that it also removed some of the carpet strands. 2. BEST METHOD. I used liquid TSP diluted with a bit of water (test in an inconspicuous area first) and let it sit. After it broke down, I scrubbed it with a bristle brush and it came out perfectly. 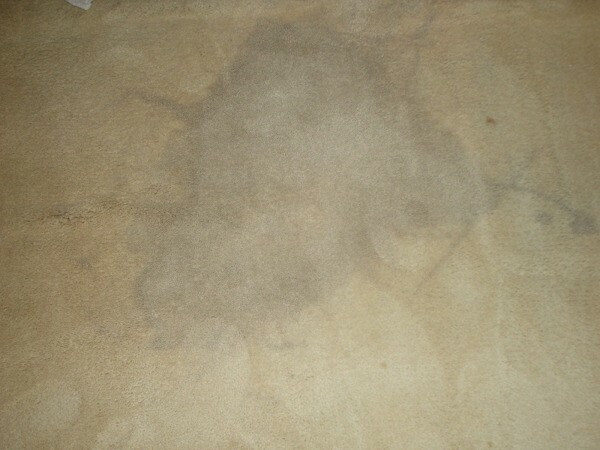 To remove the TSP residue, I used a home carpet steamer with plain water until it returned clean water only. That area looks a bit more worn than the rest of the carpet but WAY better than if the stains were still there. I have a paint stain that is set in my carpet! Please help me on what to use on the carpet to get it clean. What is the best thing to use? I used paint remover once when I spilled a whole can of stain on my grey carpet. It took it right out but has a very stong odor. Test in a closet or something first and be sure to have your windows open. I used to do new construction cleaning and always had to clean up paint messes/splatter/spills off the carpet before a walk through. I used "Goof Off". Its the one in the spray bottle, its a lower odor one then the ones in the cans. You can get it at Home Depot. Test it first in a closet area for your carpet. I would spray it on and let it soak for a few minutes then use a clean white towel to clean it up. Worked great everytime. Love the stuff! Here is a link to their site. It has many uses for it on many different surfaces also. A friend of mine is a professional carpet cleaner and he uses odorless mineral spirits to remove paint from carpet. You can buy it a a hardware store. Dab it on/off, don't rub and make sure you dispose of properly as not to cause spontaneous combustion. I spilled red mahogany paint stain on a light green carpet. It has spread everywhere. We tried mineral turpentine. Any hints? I was painting with red wood stain/paint and spilled it on a cream color carpet. How can I get the stain out of the carpet?